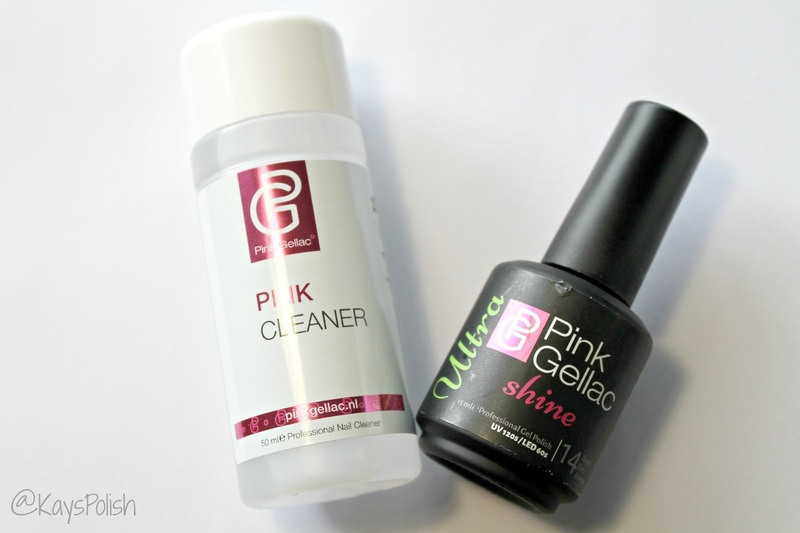 Wow, now I don't know where to start but I do have to say a super long while ago I got the chance to speak with the amazing Mees at Pink Gellac and she generously sent me some shades and products to review... I feel so bad that I hadn't had time to finish the swatches and now they are here! First of all, the package, even if coming from the Netherlands, came super fast and was packed in a super cute way... I still keep the box because I just love it! It came with a very practical lamp to cure the gels which I love because it is small enough to fit anywhere I need to bring it but it is still big enough for not having to stick all the fingers together. Then cam all the items; Primer, Base, Top, along with four beautiful coulours and a bunch of little accessories like a cleaner, orange sticks, wraps and lint free papers. Now I got to swatch these beautiful colors and even made some art with some of the colors! In order, I got the colors Tropical (#156), Candy Pink (#158), Intergalactic Purple (#162) and Burgundy Red (#205). For the nail art, you know how I love stamping and that is what I did. The colors used for the art are in the same order, the last 3 shades. For the stamping, I used plates from Ejiubas and the Born Pretty Store. The stamping polishes used are all from the Born Pretty Store. Can't wait to get some more goodies from pink Gellac because they are truly easy to work with and the colors are gorgeous!!! Now that the swatches and art are all shown, I wanted to tlk about a little something that happended to me with those products. Now everything arrived here in perfect condition, except for the top coat which I was so sad about, but what I didn't know about was the Pink Cleaner that came in the package. This stuff if litterally MAGIC! After writing a little email they told me to use it and WOW! What a great surprise! My top coat had arrived with its brush super stiff and all dried up. I just had to wipe the brush with some pink cleaner and a lint free paper and DONE the brush was as good as new and is now working wonders! Seriously thank you Pink Gellac!